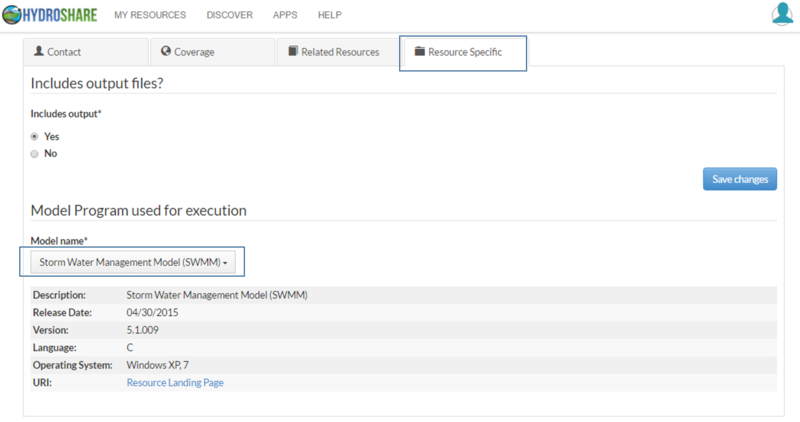 After creating a Model Instance resource, you should fill out the metadata on the resource landing page. The metadata fields for a Model Instance Resource are different than those for other resource types. See below on editing metadata for a model program resource. 2. For the ExecutedBy term, select the Model Program that is used to execute the Model Instance resource from the drop list under “Model name”. 3. Once the Model Program is selected, some related metadata appear to verify that you select the correct Model Program. Click “Save changes” to save the selected Model Program resource.